It’s wonderful to be able to spend another summer in Buenos Aires and escape Chicago’s winter—however warm, snowless or cold it may be there! Though the calendar says I’ve been here nearly a month, I feel like I only recently arrived. Yet here I am in late January with temperatures in the mid-90’s all week! Welcome back to my southern home. A few new museums have opened since I was last here, and I’ll review them as soon as I can get to them all. Meanwhile, good food, good friends and good conversation have been my favorite trio for a long time, so it is delightful to be the guest at my “welcome dinners” with friends here, like this outdoor Sunday lunch with homemade pasta and lots of local treats. Nothing brings a smile to my face quicker than being stopped on the street by an Argentinian asking ME for directions. So I had a double smile yesterday as not one, but two different women, one in her 20’s, the other in her mid-forties, stopped to ask me for directions. As satisfying for me was actually being able to give them the information they wanted! Such moments make me really feel like a porteña (a local here)! The amount and variety of free music here is wonderful. The city of Buenos Aires sponsors free music in what are called the “Bares Notables”, local bar-restaurants that are more than 100 years old. It’s a great way to support these places and the musicians that play in them. Each weekend a local park offers milongas, with music, singing and dancing—all free. Another free music “find” was at an outdoor photo exhibit of the early years of the city’s famous Teatro Colon Opera House. There, speakers are positioned in the garden where opera music is played continually. Last Sunday as my friend Grizelda and I strolled through the park we viewed the photos while enjoying the music. Nearby in the park a group of young drummers and dancers practiced their routines, no doubt preparing for a murga, or marching parade of drum and dance clubs or groups. Such groups are common sights in various barrios during summer months, this one no doubt preparing for the upcoming two days of Carnaval to be celebrated Feb. 11-12. Not so common–actually pretty rare I expect–is the sound of bagpipes here. But that’s what I happened on to yesterday. Imagine my surprise as I followed the sounds of “O come all ye faithful” played on bagpipes to discover a young Argentinian practicing away! 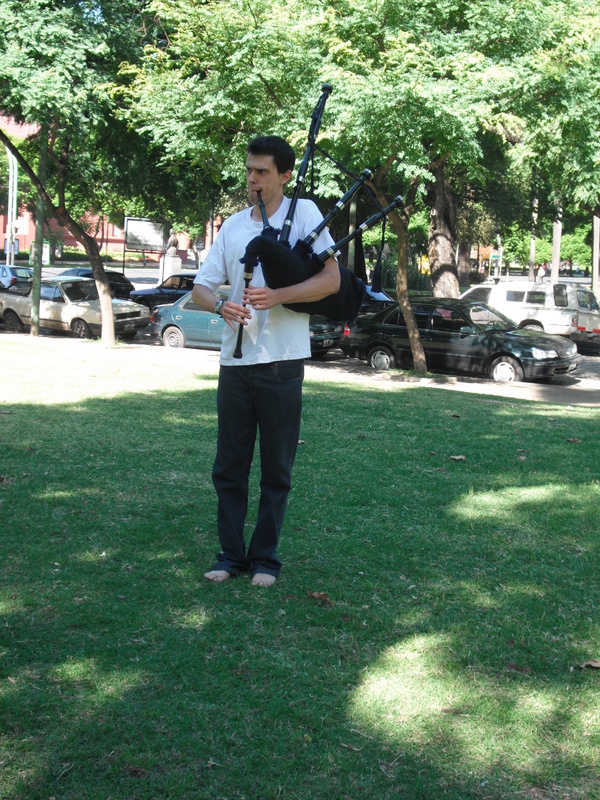 My curiosity compelled me to talk with him, and I learned that he, Andres, a porteño, has been playing for 3 years on a set of Scottish bagpipes given to him by his Irish grandmother! Must be my karma–two days later as I rode a city bus we passed another bagpiper playing away on the street in the middle of the day. 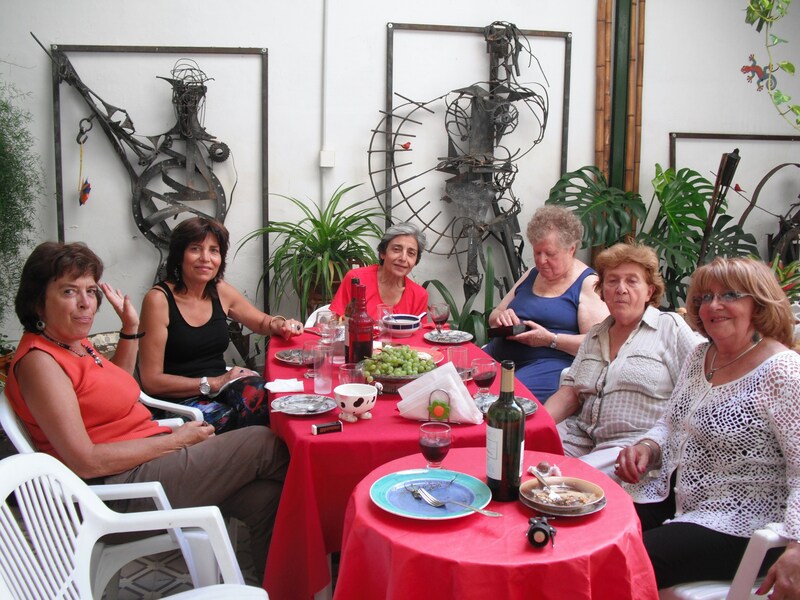 And yes, there is always tango to listen to, as I did with friends last Saturday, over dinner in a neighborhood spot in Boedo, La Cuarenta, where the owners, a couple, sang classic tangos and invited the diners to join them, adding another woman and 2 men to perform solos. Fun! 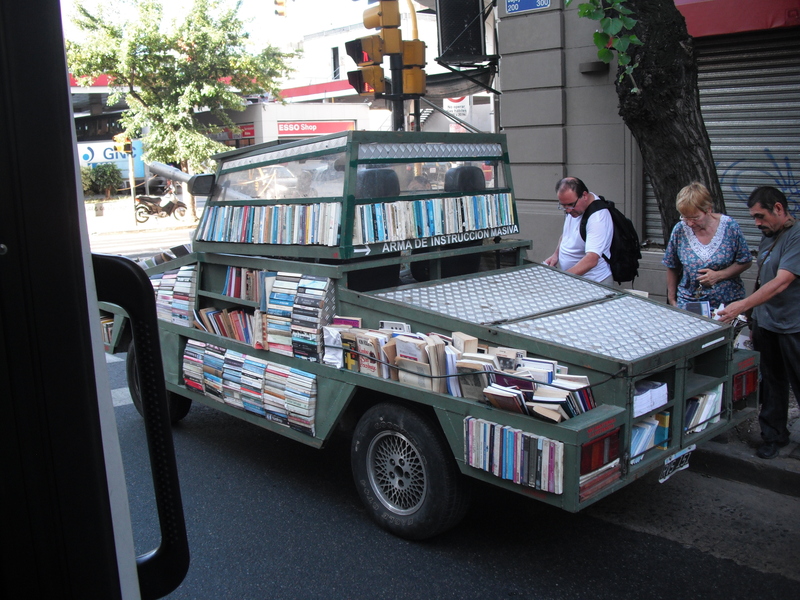 Lastly, I just have to share my photo of this car re-purposed as a travelling library that I’ve seen around the city. Looking like a small tank, the sign on it reads “arm of massive instruction”! What a wonderful use for military tanks, don’t you think? If only we could re-purpose all the weapons of mass destruction to be like this one. Peace to you in 2013. What a wonderful post, Di! You capture what makes cities so engaging — unpredictability, creativity. Wish I were joining you but busy at work as a cycling instructor and advocate. Thanks Dee Dee! I love your stories! Have continued fun! I’m sure you make everyone who reads your posts wish they were there. . .I know I did. Sounds so interesting and fun to explore. Enjoy & have a great “Summer”. Sounds so wonderful. Maura and I and our two sisters are hoping to come to Buenas Aires next January or February! We’ll talk. A great start to your second summer. Thanks for sharing. I always enjoy reading about your time in BA ..hope to join one of these days. Now that I have a context, I enjoy your porteño posts even more! Love the traveling library; let’s see more of that.